NEW YORK--(BUSINESS WIRE)--Private Division, Squad, and BlitWorks announced today that Kerbal Space Program Enhanced Edition, the new console version of the beloved space simulation game, is now available for digital download on PlayStation®4 computer entertainment system and across the Xbox One family of devices, including Xbox One X. Kerbal Space Program Enhanced Edition is built from the ground up to include re-worked and console-optimized UI, a new control scheme exclusively for consoles, and more ways to enjoy launching your spaceships into orbit. In addition to the optimizations for console gameplay, Kerbal Space Program Enhanced Edition incorporates the Kerbal Space Program 1.2.2 “Loud and Clear” update from the PC version. This includes a broad range of improvements and features that boost the overall game experience from the prior console version, such as new communications methods between your HQ and spacecraft, more tweakable options while constructing rockets, a complete fuel system overhaul, and much more. As a thank you to the existing console community, all owners of the prior console version of Kerbal Space Program can redeem the Enhanced Edition for free*. In Kerbal Space Program, you take charge of the space program for the alien race known as the Kerbals. You have access to an array of parts to assemble a fully functional spacecraft that flies (or doesn’t) based on realistic aerodynamic and orbital physics. Launch your Kerbal crew into orbit and beyond (while keeping them alive) to explore moons and planets in the Kerbol solar system, constructing bases and space stations to expand the reach of your expedition. Kerbal Space Program Enhanced Edition is available now for digital download on PS4™ system and Xbox One. Kerbal Space Program Enhanced Edition is rated E for Everyone by the ESRB. For more information on Kerbal Space Program Enhanced Edition, subscribe on YouTube, follow us on Twitter, become a fan on Facebook, and visit www.KerbalSpaceProgram.com. *Must be redeemed on same PlayStation™Network or Xbox Live account as original Kerbal Space Program purchase. 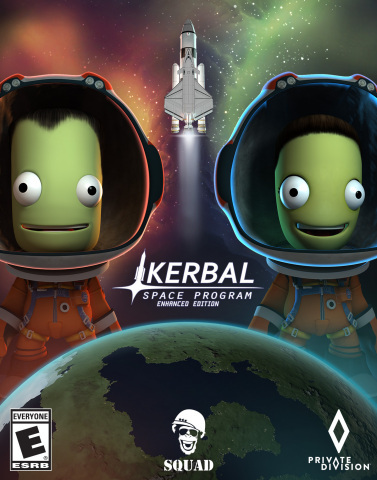 Kerbal Space Program Enhanced Edition will appear in your library as a separate game. No data from prior version will be overwritten, and save files from prior version will not be compatible with Kerbal Space Program Enhanced Edition.